It’s hard to believe it’s been a year starting the adventure of Techstars Boulder. During the three months of the program, we spent a lot of time putting together our vision for Stateless, and the kind of company we want to be. From that vision we created our Corporate DNA. As we reach the one year anniversary of our DNA’s development and look ahead to an exciting year in 2018, we wanted to take time to explain our DNA and share it on the blog. This is the reason Stateless exists as a company. It captures our motivations behind our work and inspires us as we tackle problems, big and small. These are the beliefs that all members of our team share and are committed to embracing. These give all team members high-level guidance about what to do and what not to do. These mantras guide the decisions we make individually and as a team. The DNA was first developed by our co-founders Murad and Eric. It was then shared with the rest of the team who gave their input and updates to ensure it was the best possible representation of Stateless. Each month we spend the first portion of our all hands meeting reviewing our DNA so it is top of mind with all team members. It is on the walls of our office to remind us each day of the company we strive to be, and as of today it is also on our website. 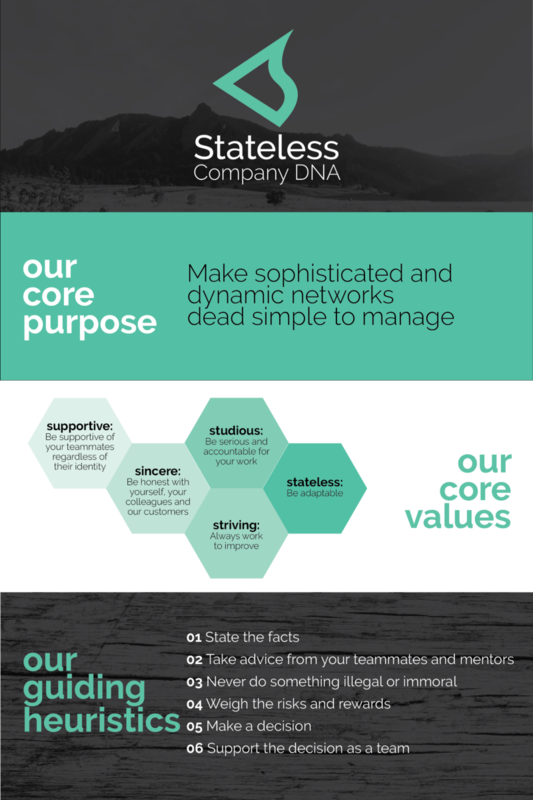 Our Corporate DNA has helped us to gather an astounding team of employees, advisers and investors, who are all working towards our core purpose of making even the most sophisticated and dynamic networks dead simple to manage.